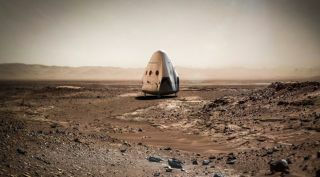 SpaceX's "Red Dragon" concept envisions using a Dragon spacecraft with only minor modification to land on the surface of Mars for both its Red Dragon spacecraft and future human missions. THE WOODLANDS, Texas — SpaceX has been working with NASA to identify potential landing sites on Mars for both its Red Dragon spacecraft and future human missions. In a presentation at a symposium here March 18 on planetary surface exploration and sample return, Paul Wooster of SpaceX said the company, working with scientists at NASA's Jet Propulsion Laboratory and elsewhere, had identified several potential landing sites, including one that looks particularly promising. Another is to be close to the Equator and at a low elevation for solar power and better thermal conditions. "It's probably hard to find that along with ice," he acknowledged, so the focus has been on four locations at latitudes no more than about 40 degrees from the Equator. Wooster said the study identified four regions in the northern hemisphere of Mars that met those basic criteria. Three of the regions — Deuteronilus Mensae, Phlegra Montes and Utopia Planitia — looked attractive in images from a medium resolution camera on the Mars Reconnaissiance Orbiter called CTX, he said, but appear rockier in high-resolution HiRISE images. "The team at JPL has been finding that, while the areas look very flat and smooth at CTX resolution, with HiRISE images, they're quite rocky," Wooster said. "That's been unfortunate in terms of the opportunities for those sites." A fourth region, Arcadia Planitia, looks more promising in those high-resolution images. "What they've found is basically few or no rocks, and a polygonal terrain that they think is pretty similar to what was seen at Phoenix," he said, referring to NASA's Phoenix spacecraft, which landed in the north polar regions of Mars in 2008. Those landing sites are of particular interest, he said, for SpaceX's long-term vision of establishing a human settlement on Mars, but he said the company wouldn't rule our sending Red Dragon spacecraft elsewhere on the planet to serve other customers. "We're quite open to making use of this platform to take various payloads to other locations as well," he said. "We're really looking to turn this into a steady cadence, where we're sending Dragons to Mars on basically every opportunity." The Red Dragon spacecraft, he said, could carry about one ton of useful payload to Mars, with options for those payloads to remain in the capsule after landing or be deployed on the surface. "SpaceX is a transportation company," he said. "We transport cargo to the space station, we deliver payloads to orbit, so we're very happy to deliver payloads to Mars." When SpaceX announced the Red Dragon program last year, it planned to perform the first launch as soon as the spring of 2018. Last month, however, SpaceX President Gwynne Shotwell said it was likely that mission would shift to the next Mars launch window in mid-2020. Wooster said the slip didn't have anything to do with issues with the mission itself. "Overall, we just had a lot of things on our plate at SpaceX. It's not anything specific to Red Dragon," he said.